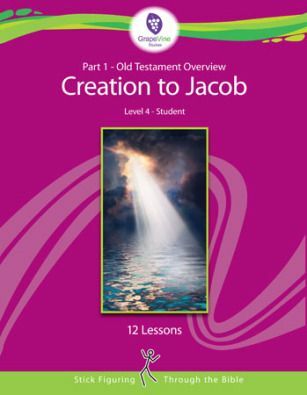 This time I’m reviewing Old Testament 1: Level 4 Creation to Jacob from GrapeVine Studies. We received a download file to download all four parts of the story Creation to Jacob. We also received the teacher guides as well in download file format. This was we can print it out and make books out of it. The below chart shows how to determine which book is recommended for your child based on age and the focus of the story you’d like your child to learn. Part 1 has 12 lessons while 2-4 has 13 lessons. Part 1, 2, and 4 has 65 pages while Part 3 has 66 pages. If you plan on printing this out for each child, you’ll need plenty of printer paper, plus the 4 teacher’s guides. What I did was, I printed each book out, one book at a time for each boy, and then for the teacher’s guide I just saved them to iBook on my iPad and used them that way. 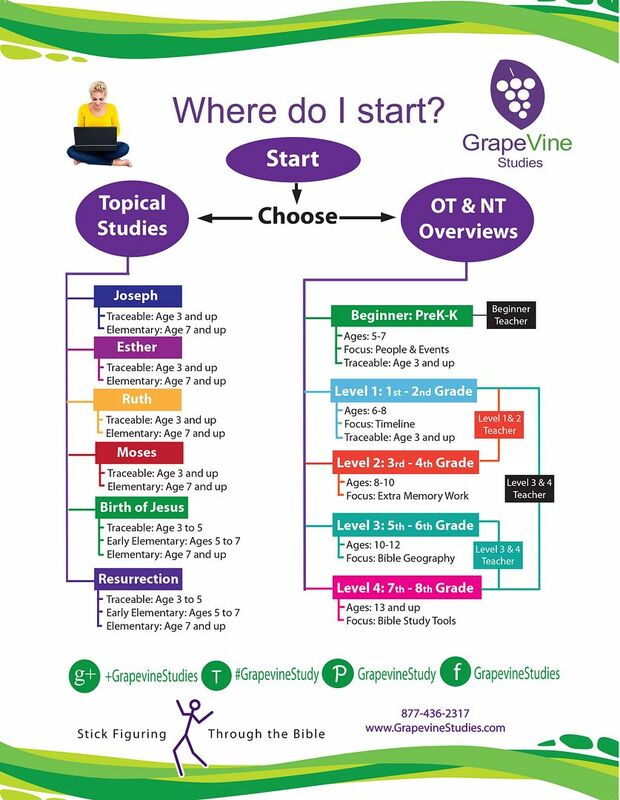 The chart below shows what each level will have the kids doing. How I used this for us was, I used a dry-erase board to do the lessons. I gave them their packet of the book, they needed it to draw along with the story. I would stand in front of the room and I would have each boy take turns reading the verse, then I would discuss the verse, using the teacher’s guide, and then we would draw that seen. The teacher’s guide has what to draw, so I would just draw what it had and they would draw it the way they saw it. Below is what the Part 1 student book looks like. At the end of each lesson is also a Lesson Review, this asks questions about what they just learned, to see if they were paying attention. 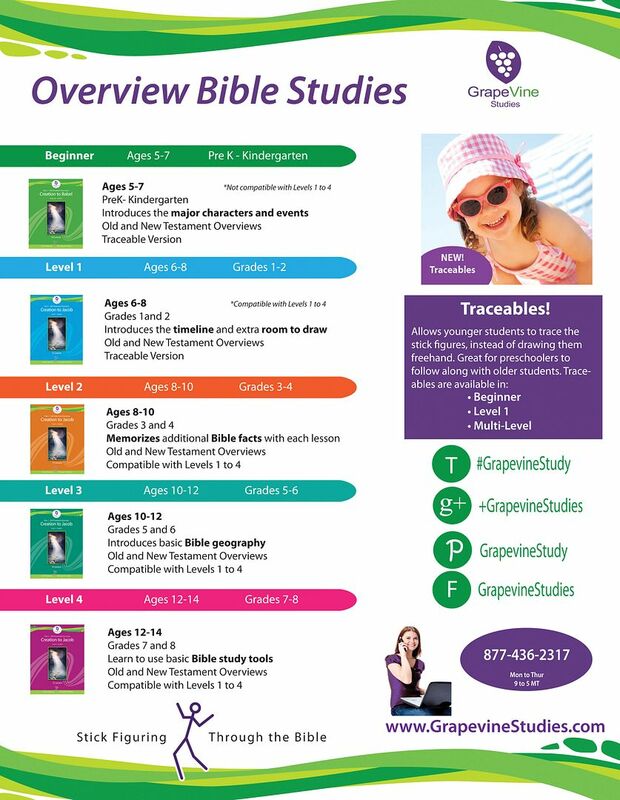 The Quest page has them using a Topical Bible, Bible Dictionary, and a Bible Concordance to answer questions. I really liked this way of learning the bible, I even learned along with them. The drawing reinforces the lesson, so it’s not just answering questions. Kids seem to learn more when they’re having fun doing it. So instead of just reading and answering questions, or just reading something and drawing, then get to do both! The boys really liked the drawing and coloring part. Typical kids. They tried to out draw me, I stuck to my stick figures. I really like how the books use stick figures as well, I don’t have to see this really complicated picture that I need to replicate.